Experience the best of the French Riviera during a small-group day trip from Monaco. Watch multi-million dollar yachts bob in the water off Antibes. See where Hollywood stars walk the red carpet at Cannes' Festival Palace. Tour a perfumery in the hilltop village of Eze. Visit stately Monaco to see the royal palace and ornate casinos. Drive the Formula One Grand Prix track in Monte Carlo. Group size is limited to eight people to ensure more personalized attention from your knowledgeable guide. 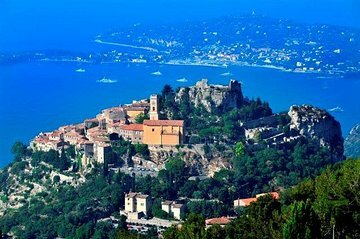 See some of the best of the French Riviera in one day and without any planning hassles with this small-group day tour. Dive right into the scenic beauty of the area as you drive from Monaco to Antibes, the first stop on the tour. Visit the historic center of charming seaside Antibes, and don't miss Billionaire's Quay – some of the biggest luxury yachts in the world are often found here. Continue on to Cannes, where you'll drive the glamorous Croisette Boulevard (Promenade de la Croisette) lined with chic shops and restaurants. Stop at the Festival Palace (Palais des Festivals et des Congrès) to see the location of the Cannes International Film Festival which takes place here annually. Travel on to the quaint town of Saint-Paul-de-Vence, a picturesque piece of Provence that many artists and actors have called home. Take a midday break here for lunch (own expense) before continuing the tour with a drive up the Middle Corniche, noted for its fantastic views overlooking the Mediterranean. 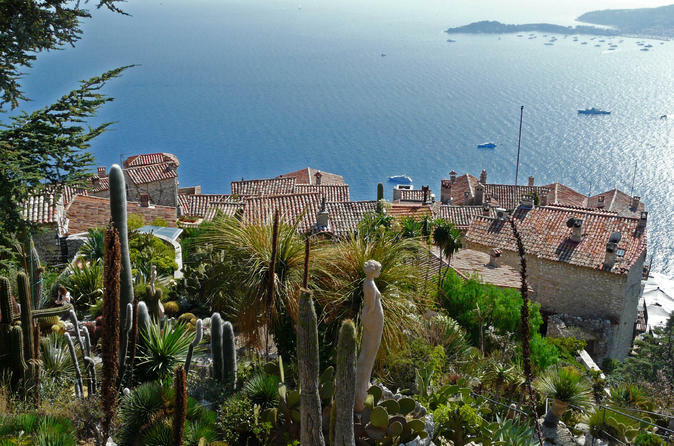 Arrive at the village of Eze, perched high on a hill, for more amazing views. Take a guided tour of Fragonard, one of the region's famous perfumeries. Travel past the village of La Turbie, known for its ancient Roman monument called 'Trophy of the Alps,' built by Emperor Augustus in the 1st century BC. Return to Monaco to see the Prince's Palace (Palais Princier), manicured gardens and luxurious casinos in Monte Carlo. Drive on the Formula One Grand Prix circuit that runs through the city before being returned to your hotel at the conclusion of the tour. We thoroughly enjoyed this tour in October 17. Our guide was friendly, helpful and attentive. The itinerary was fantastic and included the harbor of old Antibes, the town of Saint-Paul-de-Vence and the ancient village of EZE. All were simply marvellous. The itinerary ensured a visual feast which we will never forget. We highly recommend this tour. I have had 5 star reviews with other Viator trips. This one didn't come close. First the good/best part. The guide, also the driver, Jamie, was excellent. He was prepared and a very safe confident driver. The problem with the tour was time management. This could be fixed by picking up a hotels ONLY. We waited 1/2 hour for a woman that he never located at a Air B and B. That put us behind and got us into morning rush hour traffic. This was avoidable. We missed the perfume factory tour because of it. By that time the tour busses had arrived and the lines were too long. THEN.. they added on a couple for the afternoon portion. The searching and waiting started all over again. We spent way too much of the time waiting. Way too much. We finally gave up on it and asked to be dropped off without seeing the Cannes portion at the end. My guess is that there are better organized tour operators for this experience. Suzana was a great guide and driver - she personalized the trip as much as possible for the groups in her van. She was very knowledgeable and kind. She went out of her way to make the day special!! Highly recommended to see the sights of the French Riviera whilst staying in Monaco/Monte Carlo! Excellent tour! You are taken to a number of places and you spend a short time at each place. This was perfect, because at the end of the day, you have an excellent overview of what is in the area and you can make notes as to what you want to go back and visit. The guide was Renaud and of every tour guide that I have used, this guy is by far the greatest. He is intelligent, entertaining and funny. Renaud is definitely a positive asset for your organization. He represents your company in a very positve manner. Overall, it was an excellent tour and well worth the money spent with this tour. It's a lot of driving and not much information. Still worth going but don't expect to find out anything about Nice. Just a quick drive through the highway. We had a fantastic day with a wonderful driver for the six of us. We travelled from the dock in Monte Carlo to Cannes, and then along the French Riviera. The views were stunning and the countryside was charming. The only downside was having to pick up a couple in Nice who were joining us for the afternoon. The first part of the drive through Nice was interesting, particularly seeing the flowers along the route where so many were killed or injured just days before. However, the French President was coming in just after we were driving through and roads were closed/clogged as a result. We ended up being quite late in returning to our ship and got only part of the normal tour of Monte Carlo. Highlight of the French Riviera. Bespoke, informative and thoughtful tour with a world class guide. Money and time well spent indeed and would recommend to any discerning traveller. Great tour: best of an eleven day cruise. Nicolas was a great guide who took us to places others on the boat, on different tours, did not see. Very good value for the money. It was a great tour. OUr guide arrived right on time and took us around for the full day showing us Monaco, the French Riviera and several castles. Spectacular scenery. Our guide was very friendly and helpful. Well worth taking a day for the tour.